Staying organized has always been a struggle for me! 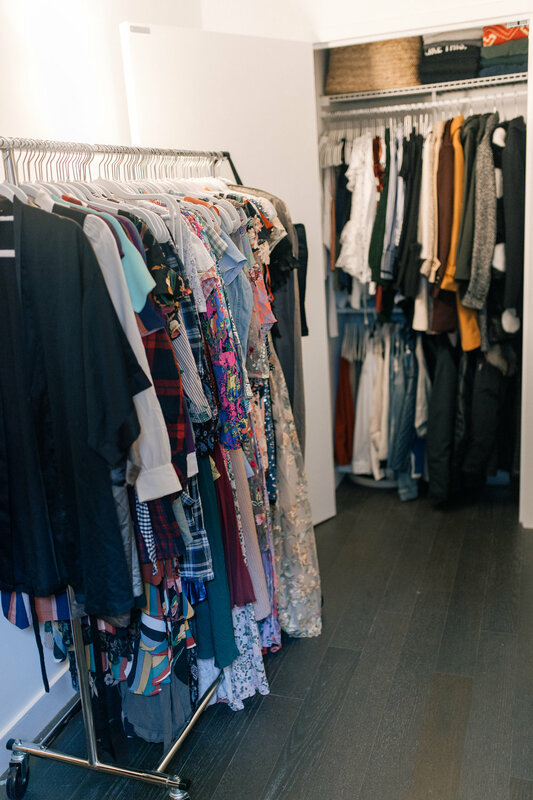 I partnered with the amazing team at Neat Method to help organize my closet and I’ve already felt my mind become clearer, productivity greater, and anxiety lower. Hoping to pass along the feeling to you too! The key takeaway I learned to live an organized life — find each item a home. We started by allocating specific categories to each space. For example, I now have a section for jewelry and make up, an area for shoes, an area for summer clothes, and an area for winter clothes and coats. Fair warning, this is the messy part 🙈 First things first, take a look at the space you want to organize. Let’s say your bathroom cabinet. Next, empty it out completely. Now don’t be scared when you see the pile on your floor! Take a deep breath and go through each item one at a time. 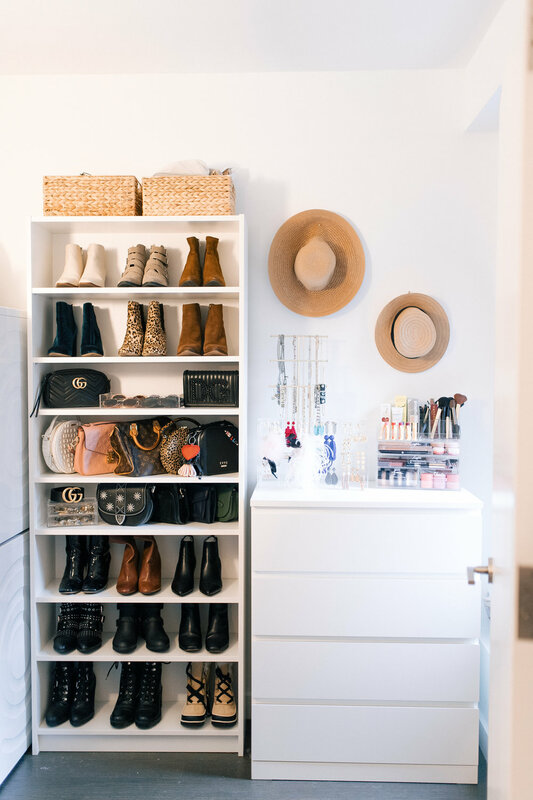 Place similar items together so piles are divided by categories such as nail supplies, hot tools, facial cleansers, feminine products, and brushes. Once all the items are dispersed, take a look at the size of the piles and find bins that will be the right fit for each. Keep in mind that the key to organization isn’t to toss everything into one large bin. Separate first so that you can use the bin that best fits each grouping’s needs. Set a rule for yourself that each day when you come home you will spend 30 minutes tidying up, at the very least putting away what you wore that day. It’s kind of like when you were a kid and your parents told you to put away the toy you were just playing with. In the same sense, hang up that coat you were wearing and put the purse back in its rightful place. Before you know it, you just saved yourself 3.5 hours’ worth of Sunday scaries cleaning! Picture it – you just did laundry and have dumped the clean clothes onto the couch. You swear the pile is growing the longer you put it off! In addition to folding the clean laundry right away, Neat Method gave me some advice to make this humdrum task more meaningful: put good intentions into each piece of clothing you fold. Think of the business pitch your boyfriend will nail as you straighten the collar on his button-up. Think of the job interview you’re going to smash as you fold your lucky dress. Think about how much better the day is going to be for you, him, or another loved one because you put love into it! If you don’t consider yourself an organized person that’s OK! We all have different skill sets and there are people out there to help you build this one. I highly recommend reaching out to a company like Neat Method and organize your home. Their team was sweet, timely, nonjudgmental, and totally made the transformation stress-free. Located in New York City and across the U.S. - honestly think everyone should invite Neat Method to check out their home, always room for clean-provement! Big thank you to Neat Method for partnering on this post. I learned a lot and hope you all did too! Be sure to follow Neat Method on Instagram and on their blog.